Sometime last year, my son dropped my V-Cube 7 on the floor. 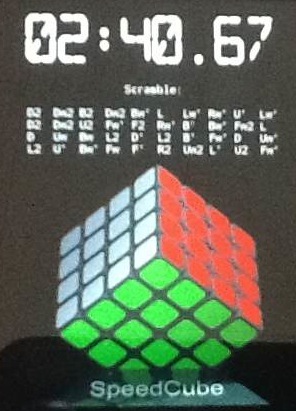 It shattered, that dreaded CHSSSSSSSS sound only cubers can recognize. I’ve tried to rebuild it, but I’m not so good with the tiny pieces and just gave up. I never really liked the puzzle anyway. This one is a few months old, but that’s OK. This isn’t unusual, but every so often I’ll grab my best 3×3 and see if I still have it. 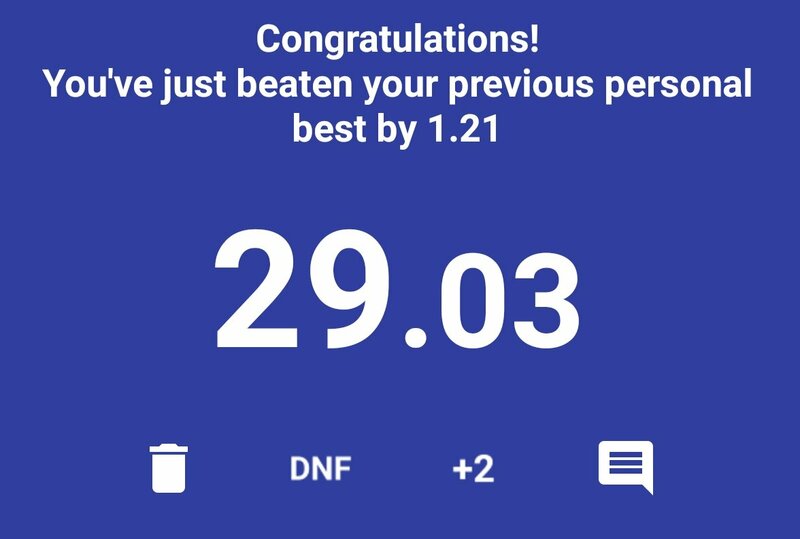 A sub-40 average is usually my goal, but my ninth solve on this day was just remarkable. I slammed together that first layer in like 8 seconds. The second layer was average, but I think I had two last-layer skips. It was one of those moments where you just know this is something special. As only my third sub-30, I was utterly thrilled. Anyhow, new record! Oh, and a quick check of my cubing records reveals that this new time came precisely one year after I got my last sub-30 record! I suppose I’ll have to make another go on the 18th of May, 2019! 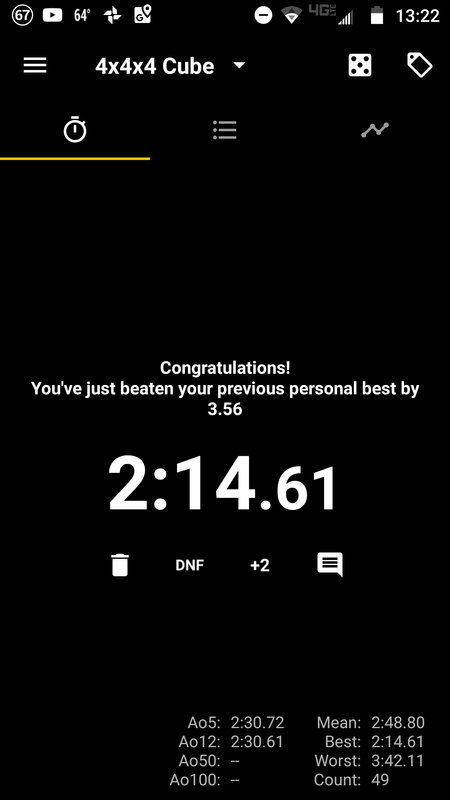 On the same day that Feliks broke the 7×7 world record, with a 2:08 showing, I managed to shave four seconds off my modest 4×4 personal best. A 2:14+ time may seem quaint to these speedcubers, but it’s the best I’ve ever done. My newest cube, a stickerless QiYi MoFangGe Snow Leopard, isn’t really great. It’s exploded several times and I am pretty sure I lost a record just in trying to keep it from doing so again. However, a parity-free run this morning yielded a pretty good time. While I don’t think a sub-two-minute run is ever to be in the cards, I’ll remain humble with this new record. New 3×3 Record! 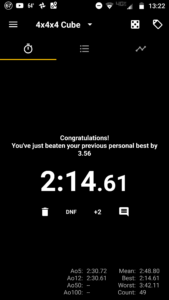 First Sub-30! OMFG! I’ve been waiting for this moment for six years. I had a session yesterday where everything was clicking. My average of 5 was 34.06. Average of 12 was 35.11. Average of 50 was 37.29. I could just see the entire solve more clearly than ever. 100 Solves. New 3×3 Record! I don’t cube like I used to. My collection continues to grow, recently an Eitan’s Twist and a 2x2x4 entered the fold, but I don’t go for speed like the old days. 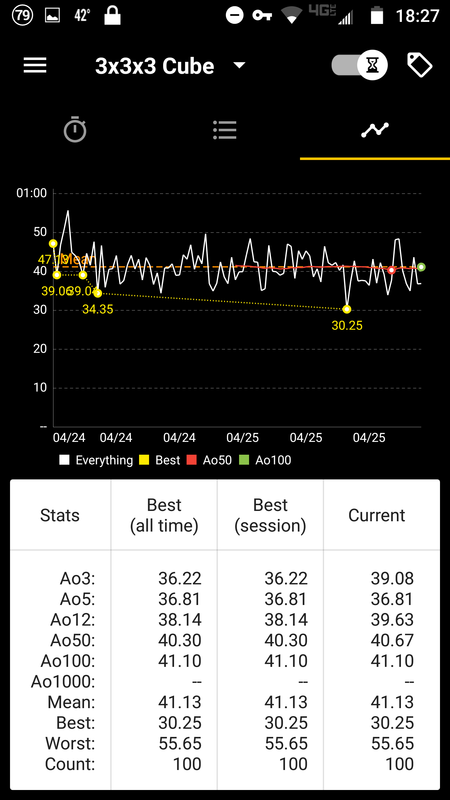 (five years ago, heh) After seeing some people using an app called Twisty Timer which tracks your times and charts them, I figured I’d just see how I stood. 100 solves later and my average was just over 41 seconds. My old Average Of 5 record has remained unbroken for over four years, mainly because I don’t really ever challenge it. I was about half a second too slow to challenge that one but…what’s this? Oh right, a new personal best!!! I missed the elusive sub-30 claim by a mere quarter-second, but I’ll take it. 30.25 is my new 3×3 record. Maybe 100 more solves will give me the opportunity to shave off that elusive chunk of a second? Average Of 5: Sub-40 Still! It’s been a few years since I posted any real cubing milestones. I have not stopped cubing, certainly not, but my speed-cubing days are mostly behind me. With a few minutes to spare today, I figured I’d try my hand at an average of five to see where I stood. It’s been quite some time, really. So, imagine my delight when I realized I was still under 40 seconds! My best was a bit over 36 and my worst nearly 44. Still…it means I’m not really out of the game! Anyways, this is no record but it’s good enough for me!!! Visual evidence! 33.39, huh? That’s a pretty good time. What would’ve been an incredible record just a few months ago is merely a ‘pretty good time’ now. Well, I have a few minutes to spare, why not another run or two? 38, 37, 34, 37 seconds…WOW. That was five runs in a row of not only under 40, but well under 40! My average-of-five record stood at 39.31. It’s now three seconds better! Wow! Pretty psyched. That was fun. 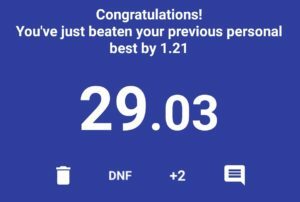 New Cubing Record: 3×3 – 31.50! The scramble left me with a very fortuitous cross and so I had the bottom layer done in less than 10 seconds. The rest of the run was good enough to break my record but I have to admit that in my head, I was hoping for a sub-30. It didn’t happen, but a quarter of a second faster than my fastest ever is still reason to be psyched. I had done a run on my stickerless Zhanchi but returned to the good ol’ black cube for the victory. I love the stickerless, but maybe it needs some tensioning. Who cares! New Record!!! I still time myself doing 3×3 solves here and there but I’ve mostly abandoned speed cubing other cubes. After breaking both my 2×2 and 3×3 records recently, in the same day, I took a peek at the larger cubes. Until I get a new 6×6 I’m not even going to try and my 5×5 attempts were far from my record (I solved in 6:11, record is just over 5:00). The 4×4 sat there, the spectacular ShengShou cube, and so I tried it. Centers were solved quickly, maybe 30 seconds. It’s that middle edge matching that kills me! Well, ultimately I finished the cube in 2:40.67, less than a second faster than my prior record. While that’s not really a huge deal, breaking my 2×2, 3×3 and 4×4 personal bests all within the same month is pretty cool. New Cubing Record: 2×2 – 9.66!!! Wait…what? TWO records on the same day? 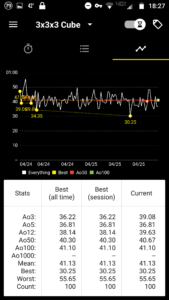 I haven’t done the 2×2 for speed since…September of 2011! So, since I had such a great 3×3 run (still psyched about that!) I grabbed my old white LanLan (which isn’t nearly as good as the QJ I have at home) and the first run I did came out at 9.66 seconds! WOW. Seriously…two records on the same day! I think this 9.66-second run is certainly a breakable record. Maybe I’ll try a few more runs!